Though there were about 50 members of the Congress at a given time, it was the states that cast the votes, so there were effectively only 13 voting members or blocs. The Congress of the Confederation, or the Confederation Congress, formally referred to as the United States in Congress Assembled, was the governing body of the Continental Congress throughout its eight-year history, although modern historians separate it from the earlier bodies, which operated under slightly different rules and procedures both during the early American Revolutionary War and the post-war period. The membership of the Second Continental Congress automatically carried over to the Congress of the Confederation when the latter was created by the ratification of the Articles of Confederation. It had the same secretary as the Second Continental Congress, namely Charles Thomson. The Congress of the Confederation was succeeded by the Congress of the United States as provided for in the Constitution of the United States, proposed September 17, 1787, in Philadelphia and ratified by the states through 1787 to 1788 and even into 1789 and 1790. The Congress of the Confederation opened in the last stages of the Continental Army, had journeyed to Annapolis after saying farewell to his officers (at Fraunces Tavern) and men who had just reoccupied New York City after the departing British Army. At the Maryland State House, where the Congress met in the Old Senate Chamber, he addressed the civilian leaders and delegates of Congress and returned to them the signed commission they had voted him back in June 1775, at the beginning of the conflict. With that simple gesture of acknowledging the first civilian power over the military, he took his leave and returned by horseback the next day to his home and family at Mount Vernon near the colonial river port city on the Potomac River at Alexandria in Virginia. The War of Independence saddled the country with an enormous debt. In 1784, the total Confederation debt was nearly $40 million. Of that sum, $8 million was owed to the French and Dutch. Of the domestic debt, government bonds, known as loan-office certificates, composed $11.5 million, certificates on interest indebtedness $3.1 million, and continental certificates $16.7 million. The certificates were non-interest bearing notes issued for supplies purchased or impressed, and to pay soldiers and officers. To pay the interest and principal of the debt, Congress had twice proposed an amendment to the Articles granting them the power to lay a 5% duty on imports, but amendments to the Articles required the consent of all thirteen states. Rhode Island and Virginia rejected the 1781 impost plan while New York rejected the 1783 revised plan. 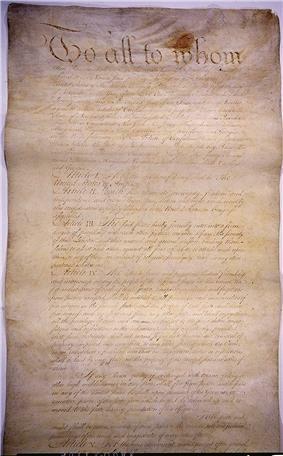 To that end, in September 1786, after resolving a series of disputes regarding their common border along the Constitution for the United States to replace the 1776–1778 Articles. The Confederation Congress received and submitted the new Constitution document to the states, and the Constitution was later ratified by enough states (nine were required) to become operative in June 1788. On September 12, 1788, the Confederation Congress set the date for choosing the new Electors in the Electoral College that was set up for choosing a President as January 7, 1789, the date for the Electors to vote for the President as on February 4, 1789, and the date for the Constitution to become operative as March 4, 1789, when the new Congress of the United States should convene, and that they at a later date set the time and place for the Inauguration of the new first President of the United States. The Congress of the Confederation continued to conduct business for another month after setting the various dates. On October 10, 1788, the Congress formed a quorum for the last time; afterwards, although delegates would occasionally appear, there were never enough to officially conduct business, and so the Congress of Confederation passed into history. The last meeting of the Continental Congress was held March 2, 1789, two days before the new Constitutional government took over; only one member was present at said meeting, Philip Pell, an ardent Anti-Federalist and opponent of the Constitution, who was accompanied by the Congressional secretary. Pell oversaw the meeting and adjourned the Congress sine die. Rather than having a fixed capital, the Congress of the Confederation met in numerous locations which may be considered United States capitals. 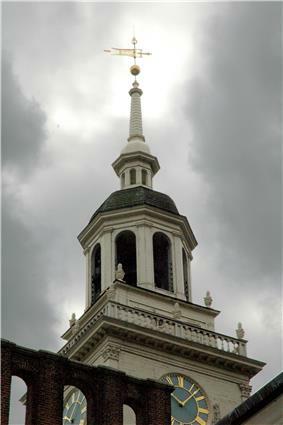 The Congress of the Confederation initially met at the Old Pennsylvania State House (Independence Hall), in Philadelphia, Pennsylvania (March 1, 1781 to June 21, 1783). – It then met at Nassau Hall, in Princeton, New Jersey (June 30, 1783 to November 4, 1783), – at the Maryland State House, in Annapolis, Maryland (November 26, 1783 to August 19, 1784), – at the French Arms Tavern, in Trenton, New Jersey (November 1, 1784 to December 24, 1784), – and the City Hall of New York (later known as Federal Hall), and in New York City, New York (January 11, 1785 to Autumn 1788). ^ "Journals of the Continental Congress, 1774–1789", Edited by Worthington C. Ford et al. 34 vols. Washington, D.C.: Government Printing Office, 1904–37. ^ See: Peace of Paris (1783)#Treaty with the United States of America. ^ The Nine Capitals of the United States. United States Senate Historical Office. Accessed June 9, 2005. Based on Fortenbaugh, Robert, "The Nine Capitals of the United States", York, Pa.: Maple Press, 1948. 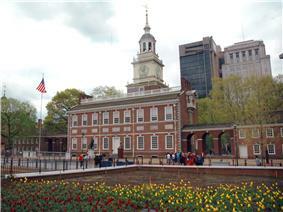 See: List of capitals in the United States#Former national capitals. Burnett, Edmund C. "The Continental Congress". Greenwood Publishing. Henderson, H. James. "Party Politics in the Continental Congress". Boston: Rowman & Littlefield. Jensen, Merrill (1950). "New Nation: A History of the United States During the Confederation, 1781–1789". New York: Knopf. McLaughlin, Andrew C. (1935). "A Constitutional History of the United States". Montross, Lynn. "The Reluctant Rebels; the Story of the Continental Congress, 1774–1789". New York: Barnes & Noble. Morris, Richard B. (1987). "The Forging of the Union, 1781–1789". New York: Harper & Row. Morris, Richard B. (1956). ""The Confederation Period and the American Historian"". "William and Mary Quarterly" 13 (2): 139–156. Rakove, Jack N. (1979). "The Beginnings of National Politics: An Interpretive History of the Continental Congress". New York: Knopf.